Today God weeps over the city of Ferguson, and over all the cities and valleys of our nation, for we have yet to recognize the things that make for peace. As we awake to the horrible news of unrest in Ferguson, of justice ignored and the weight of systemic racism upon us, let us remember the God who finds us even in the midst of our own destruction. As we seek ways to process and respond, let us reach out and support one another that together we may find a way forward. As children of God, as people of faith, we are uniquely prepared to offer space for all people in this time of discord and fear, lamentation and confusion. We would like to encourage our churches to begin this night by offering an opportunity for prayer and reflection. First, let us come together in prayer for peace – in our anger, in our sadness, in our hope – let us seek the peace that Christ calls us to. Next, let us begin, and begin again, the reflection and action that will commit us to a new way – a way out of racism and oppression. Friends, until we all come together and acknowledge the systemic racism that runs rampant in our country, until we can confess our complicity in the militarization of our police forces, until we can take seriously the lives of those we have historically disenfranchised and marginalized, we will not begin to know the things that make for peace or justice for any of us. In the coming weeks we will begin to offer conversations and resources to help our churches and our clergy lead in this time of strife. Please let us know if your congregation is interested in having a Sacred Conversation on Race or if you will be offering an event that others might participate in. Ferguson: What do we say? How do we say it? This Thursday, Dec. 4, from 2-4 p.m. Please note: The Shrewsbury location has been cancelled. You are welcome to participate in Framingham instead. If your church or community is planning on offering a prayer vigil in the next few days, or if you have resources to share, please let us know (methotk@macucc.org) so that we can put a link in our social media. Please scroll down for resources. In the name of our God of Resurrection, we are the people who can bring life out of this despair, we are called to be the disciples who see love of Christ in the depths of this pain and sorrow, and we must seek, in whatever way we are able, to act and pray and respond in love. Violence is not an answer – but it has become the natural response to injustice because there seems to so many no other way. It is time for the Massachusetts Conference of the United Church of Christ to offer and become another way forward. 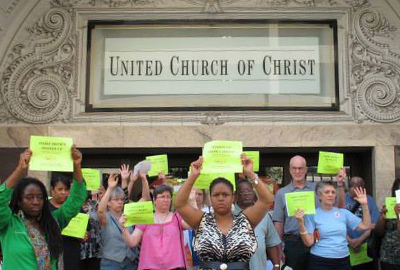 Photo: Vigil in front of UCC headquarters on the day of Michael Brown's funeral; from ucc.org. We pray for the people of Ferguson today. We especially hold in our hearts the family Michael Brown who must live their loss over and over again. No Justice No Peace! Hands Up Don’t Shoot! Our hearts made strong by the ones who stand inn the streets and hold hands in the churches and sing shout for a changed world. May the long arc of Love ever be our guide.